The TWiV team discusses transmission of Ebola virus, and inhibition of Borna disease virus replication by viral DNA in the ground squirrel genome. Vincent, Rich, and Kathy and their guests Clodagh and Ron recorded this episode at the 33rd annual meeting of the American Society for Virology at Colorado State University in Ft. Collins, Colorado. 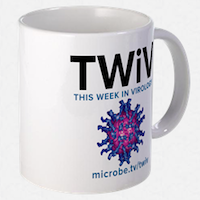 Matt updates the TWiV team on MERS-coronavirus, and joins in a discussion of whether we should further regulate research on potentially pandemic pathogens. Vincent, Rich, Dickson, and Alan review the current status of human infections with avian influenza H7N9 virus. The complete TWiV team reviews the controversial publication of the HeLa cell genome, a missing vial of Guanarito virus in a BSL-4 facility, and human infections with avian influenza H7N9 virus. Vincent, Alan, Rich, and Dickson review influenza vaccines. The TWiV four discuss an mRNA-based influenza vaccine, and a phage tubulin that forms a filamentous array in the host cell that is needed for positioning viral DNA. Vincent, Alan, Rich, Dickson, and Kathy answer reader email about rabies, xenotransplantation, poliovirus, Ph.D. programs, mosquitoes, and much more.